All New Raymarine AXIOM MFD - With built-in sonar options, LightHouse 3 operating system & blazing fast quad core performance, Axiom will transform your time on the water. Select between 7", 9" & 12.1" Displays, DownVision or RealVision Sonar (or no sonar), CPT-100DVS or RV-100 transducer, Lighthouse or Navionics charts. By buying this product you can collect up to 359 Citimarine points. Your cart will total 359 points that will be converted into a voucher of $35.90 towards your next purchase! Must be logged in to collect points. 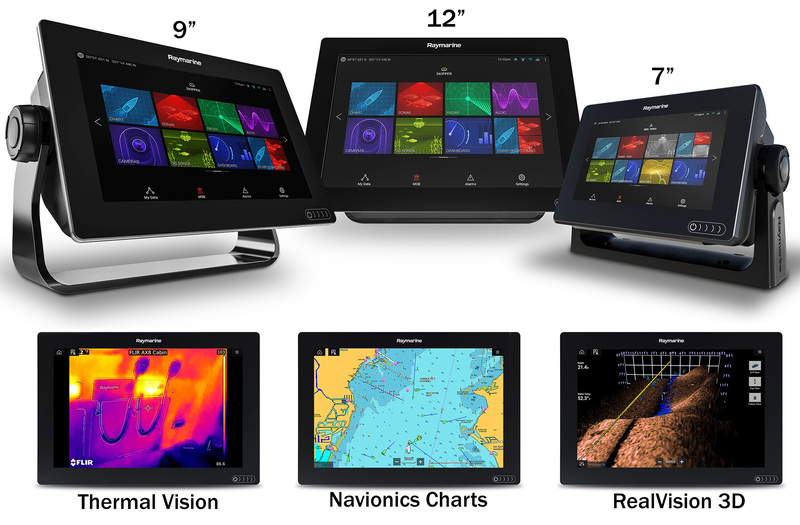 A powerful new multifunction navigation system from Raymarine. With built-in RealVision 3D™ sonar, the all new LightHouse 3 operating system, and blazing fast quad core performance, Axiom will transform your time on the water. Choice of 3 Displays: 7", 9", and 12"
Axiom is expandable, so its capabilities can grow, as needed. It supports the full range of Raymarine accessories, including Quantum radar, CHIRP Sonar, FLIR thermal cameras, audio integration, instruments, cameras, and Evolution autopilot. 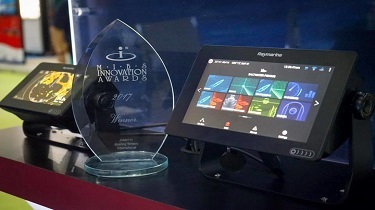 Standard Wi-Fi and Bluetooth connectivity allows connection to the latest Raymarine apps for tablets and smartphones (a future LightHouse 3 software update required for mobile app compatibility). Axiom includes surface and trunnion mounting kits, mounting hardware, power/data cable, and installation instructions. Gyro-Stabilized Sonar Technology: compensates for boat movement delivering life-like 3D sonar imagery. All-In-One Transducer: RealVision 3D Transducers combine CHIRP DownVision, CHIRP SideVision, High Frequency CHIRP, and RealVision 3D into a single transducer housing. Uncluttered Radar: New radar modes simplify operation along with quick access to sensitivity controls and enhanced status and range displays. LightHouse Live View Menu: Lets you see radar adjustments in real time. Enhaced Thermal Awareness: Exclusive FLIR ClearCruise™ thermal video analytics technology actively monitors the scene and provide alerts when any non-water objects enter the camera’s field of view. From Navionics and LightHouse Raster and Vector Charts sourced from leading map makers like NV Digital, Blue Lattitude, and more. Optimized for flush or surface mounting. Sleek buttonless desing with swipe-to-power control. Easily indentify structure and locate fish with the life-like clarity of RealVision 3D Sonar. Dimensions 7.92" x 5.24" x 3.00"
(210 x 142 x 77mm) 9.65" x 6.22" x 3.00"
(244 x 158 x 77mm) 12.36" x 8.54" x 3.00"
Raymarine always aims to stay on the cutting edge in the world of marine electronics. 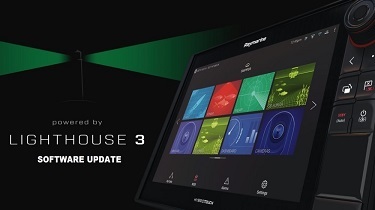 Their latest introduction of the Raymarine Axiom MFD with it’s all-new, powerful and intuitive Lighthouse 3 operating system has really shaken things up in the boating and sport fishing world. I will work to add information and links to all the newest updates to the Lighthouse 3 operating system below, as well as their benefits. Raymarine debuted their brand new Axiom MFDs (which won a MIBS 2017 Innovation Award), and Micro-Talk™ Wireless Performance Sailing Gateway technology, while FLIR (parent company of Raymarine) launched their M100 and M200 thermal cameras. Luckily, the Citimarine Store reconnaissance team were out at the show in full force, and we were able to gather intel on each of these amazing new devices. Raymarine’s Global Limited Warranty is effective for qualifying products purchased on or after 1st July 2017. Raymarine UK Ltd. and its affiliates (“RAYMARINE”) warrants RAYMARINE products purchased directly from RAYMARINE, from an approved RAYMARINE dealer (visit raymarine.com/DealerLocator to find and contact your local approved RAYMARINE dealer), or installed on a new vessel by an authorized boat builder, known as the Original Equipment Manufacturer (OEM) (the “Products”), to be free from defects in material and workmanship for;(i) Dragonfly Products for one (1) year (“Dragonfly Limited Warranty Period”); and (ii) Standard Products for two (2) years (“Standard Limited Warranty Period”); from (a) the date the Products were first purchased; or (b) in the case of Products installed on a new vessel by an authorized OEM, the date the vessel was first delivered (the “Purchase Date”) to the first retail customer (the “Original Customer”). THE LIMITED WARRANTIES AND REMEDIES IN THE GLOBAL LIMITED WARRANTY ARE EXCLUSIVE AND IN LIEU OF ALL OTHER WARRANTIES EXPRESS OR IMPLIED OR STATUTORY, INCLUDING ANY LIABILITY ARISING UNDER ANY WARRANTY OF MERCHANTABILITY OR FITNESS FOR A PARTICULAR PURPOSE, STATUTORY OR OTHERWISE. THIS WARRANTY GIVES THE OWNER SPECIFIC LEGAL RIGHTS, WHICH MAY VARY FROM JURISDICTION TO JURISDICTION. IN NO EVENT SHALL RAYMARINE UK LTD. OR ITS AFFILIATES BE LIABLE FOR ANY INCIDENTAL, SPECIAL, INDIRECT OR CONSEQUENTIAL DAMAGES, WHETHER RESULTING FROM THE USE, MISUSE, INABILITY TO USE, IMPROPER RELIANCE ON, OR FROM ANY DEFECTS IN THE PRODUCT. SOME JURISDICTIONS DO NOT ALLOW THE EXCLUSION ON INCIDENTAL OR CONSEQUENTIAL DAMAGES, SO THE ABOVE LIMITATION MAY NOT APPLY TO YOU. Subject to the terms, conditions, limitations and exclusions in the Global Limited Warranty, all RAYMARINE Products are warranted to be free from defects in material or workmanship for a period of two (2) years from the date the Product was purchased by the Original Customer (the “Standard Limited Warranty Period”). During this period and for the Original Customer, RAYMARINE will, at its sole option, repair or replace any components that fail in normal use. If the Standard Limited Warranty applies to you, RAYMARINE will not charge you for parts or labour for warranty repairs or replacements. However, the cost of transporting your warranted Product to RAYMARINE for repair or replacement is your responsibility and is not covered by RAYMARINE. By registering your Product with RAYMARINE at raymarine.com/WarrantyRegistration, you will receive important product announcements, updates and other information designed to enhance the use and enjoyment of your Product. Additionally, except for Dragonfly Products, Warranty Replacement Product, Refurbished Product and Products used for regular commercial, military, law enforcement or related purposes, if you register your Product with RAYMARINE at raymarine.com/WarrantyRegistration, the 2-Year Standard Limited Warranty is upgraded and replaced by the 3-Year Extended Limited Warranty at no additional cost. To qualify for the 3-Year Extended Limited Warranty upgrade, the product registration must be completed within ninety (90) days from the date the product was first purchased by the Original Customer. Enter Your Email to Receive $15 Dollars Off All MFDs & Chartplotters (Discount Code) On CitimarineStore.com! AXIOM XL MFD - 16", 19"